Lars Larson is well known around the Pacific Northwest; some people hang on his every word, others are known to disagree with him adamantly, this is what makes his local talk show the most listened to radio talk show in the northwest. He does not hide from controversy and seems to thrive on those who disagree with him. At just 16 years old, Lars Larson found his calling at the Mighty 1590 KTIL radio station in Tillamook; radio has been a part of almost his entire adult life. 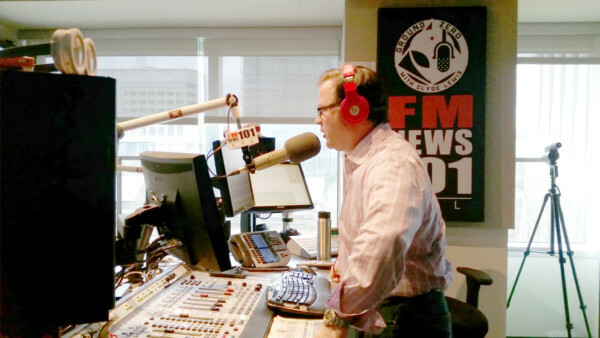 He currently works at FM News 101 KXL from 12 p.m. to 4 p.m. through Alpha Media’s Radio Northwest Network. His local show airs on 19 stations in the Pacific Northwest. He has also hosted the National Lars Larson Show since 2003, which is syndicated by Compass Media Networks to more than 100 stations. His tag line is ‘honestly provocative talk radio’. He doesn’t hold back, is not known for his shyness, and always allows ‘nay sayers’ to go to the front of the line. He touches on subjects others would rather avoid in a day-to-day conversation, such as racism, government corruptness and cover-ups as well as the subject of transgender restrooms. No topic is off limits. For a sample of a typical day be sure to visit his website at Larslarson.com where podcasts of previous shows can be listened to. One of the hot topics that he likes to touch on during his talk show is the divide between urban Oregon, and rural Oregon. According to Larson, this type of dividend would affect those in the urban areas of Oregon just as much as those in the rural areas. This would cause those in the urban areas to take a new interest in what is happening in the rural portions of the state, where industries such as logging are more prevalent. In 1983 Larson made a break from radio and went to work at KVAL television station in Eugene where right from the beginning he covered the Diane Down’s murder trial. After his stint at KVAL he began working at KPTV 12 in Portland as a reporter, and an anchor. He also produced documentaries and the NW Report. During his television career Larson worked at five different stations. Radio was in his blood however and he couldn’t seem to stay away from it, so he began working at KXL radio, having a talk show during the day and then anchoring on the evening news on television at night. Finally Larson knew he had to make a decision. He also knew that radio was so much a part of who he was, so it was an easy decision to make; he left television and began working on the radio full-time. Over the years he has work at a dozen radio stations. In his personal life he has been married to his wife Tina for 19 years and they have just welcomed their first granddaughter into the world. “It’s exciting, it’s wonderful, it’s fantastic, there’s nothing better,” said Larson about his new grandparent role. Larson has accumulated 70 awards from the Associated Press, Society of Professional Journalists and the National Press Club. He has also received two Emmy’s and one Peabody. He is currently a weekly guest on Fox News and has appeared on The O’Reilly Factor, Larry King Live, Scarborough County, Fox and Friends, BBC Radio and has been a guest on countless local radio shows around the United States. Thanks for one’s marvelous posting! I seriously enjoyed reading it, you will be a great author. I will always bookmark your blog and will eventually come back sometime soon. I want to encourage continue your great posts, have a nice afternoon! Hi there excellent blog! Does running a blog such as this require a lot of work? I have virtually no understanding of computer programming however I was hoping to start my own blog in the near future. Anyhow, if you have any ideas or tips for new blog owners please share. I understand this is off topic however I just needed to ask. Cheers!